Our children will always be kids for us no matter how older they get. We love to pamper them and enjoy doing their work for them. We love to feed them even when they are capable of doing it on their own. However, it results in one big problem and that is their unwillingness to do anything on their own. Being a mother makes us expert in multitasking, there are always thousands of chores to be done for us and we always have little time to finish everything. These days, there are servants in every house, as a result, we do not expect our children to do any of the household chores. Kids these days are smart and are able to do much more, even then very little is asked from them when it comes to sharing responsibilities at home. Many a times, it is our own laziness. We prefer doing all the work ourselves since it means that work done will be faster and to our satisfaction. But our goal is also to shape our children such that they take pleasure in contributing and taking up responsibilities. Although, making children do their age appropriate tasks would mean more work for the mothers but it is equally important for children to learn also. We have to make them understand that everybody is responsible to clean up the mess that they’ve created. We can always give them a hand in cleaning and encouragement for doing it. If we support them in doing so, they will learn to take charge of their life. If the rooms are messy, we immediately step up to clean it, which gives them a message that they can’t do it themselves. We must make them learn the responsibility for their actions, which will help them face many of the challenges later in life. Initially, it seems hard as they will always find excuses of not doing any of the household chores. The best way is to do it is to make a schedule and practice it. Start by setting up the age appropriate tasks for the kids. We can also make a chart for it. Don’t think that they are too little to do any of the household chores. Even toddlers can perform simple tasks such as putting back their toys in place after playing. Invite children to help you and let them learn that it’s a teamwork. It will help you spend time with them and a lesson for them to learn as to how to find a torch in a dark patch of life. Demonstrate and explain how to complete small tasks. Show them the right place of where the things belong. Praise them while repeating the chores that they have performed, so that it doesn’t let them feel like work. When a kid does some chore, it may not be to your level of perfection. Don’t criticise. Recognise their efforts and the completion of task. Assigning them and letting them do their age appropriate household chores will make them feel important. They will feel needed and helpful. If they learn to help now, they will be able to work hard in every field of their life later. 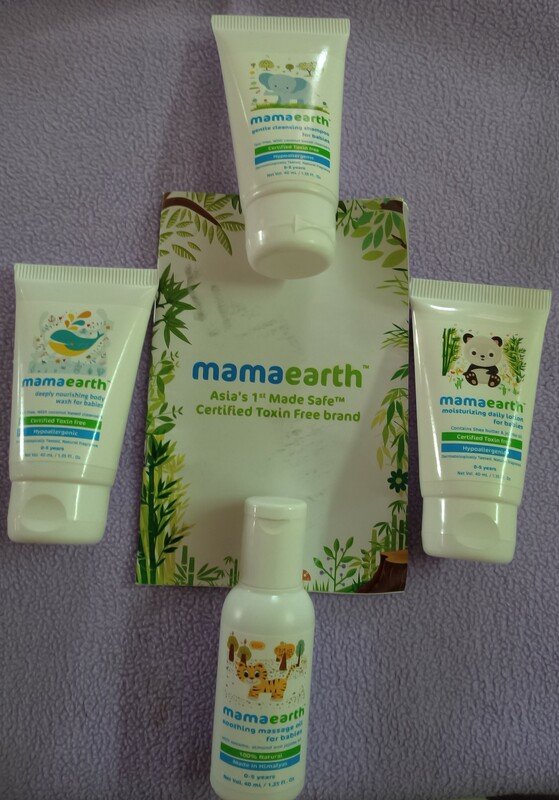 Recently, I received Mama Earth Baby Products’ sample kit from the brand. 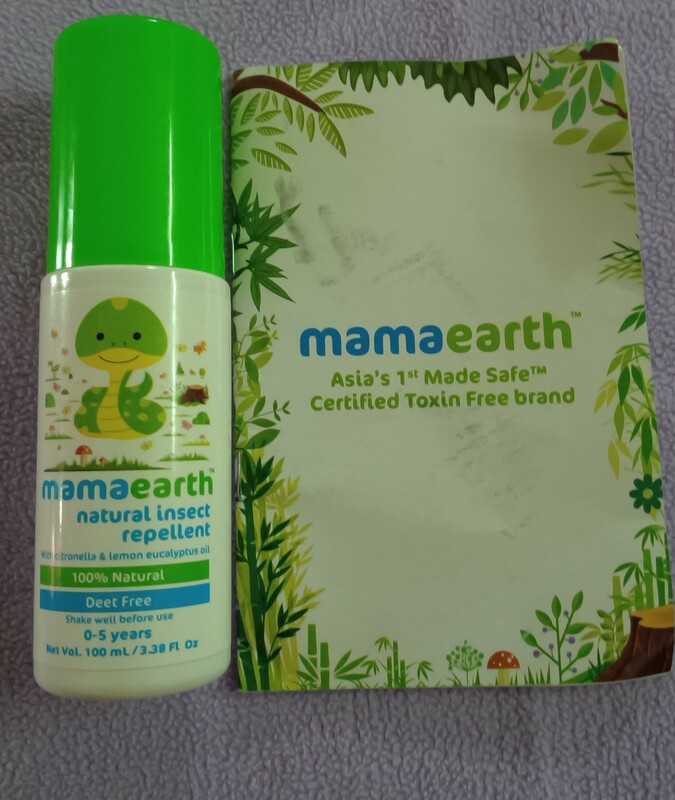 When I opened the box, I found a beautiful transparent zip pouch containing four Mama Earth Baby products. Three white small tubes and a little white bottle having pictures of cute baby animals, a different animal on every product, are very eye catching. Along with them I also received a mosquito repellent. I started reading the little booklet inside the kit which provides information about the brand and the products. I was impressed to know that these products are natural, safe and 100% toxin free. I was glad to know that these products are free from chemicals like parabens, sulphates, mineral oil, petroleum and synthetic fragrances and dyes. Hmm! Interesting! I took the mosquito repellent bottle at first. It has natural ingredients like castor oil, citronella oil, cedar essential oil, rosemary and other natural oils. However, the packaging does not mention whether it is a lotion or a spray and how it is to be used, whether it must be directly applied on skin or on clothes. I opened the bottle and decided to take a skin allergic test on myself. I never use any product on my kids without testing it on myself. I want to be sure of what I am using for them. So, I went ahead and sprayed a little on my wrist. I rubbed it gently on my skin and waited for a few hours. It smells purely of citronella oil and does not cause any irritation. At night, I decided to use it for my kids. There was no irritation and they slept all night peacefully without complaining of any mosquito bites. The next day, I decided to bathe my toddler with the products that I had received since after using the mosquito repellent I was quite satisfied with the brand. When I showed my baby her new bathing products she was very excited. I showed pictures of the animals and made stories while using the products one by one. She was happy to have new animal friends with her during bath time. The massage oil is 100% natural. Its key ingredients are: cold pressed Sesame seed oil, virgin coconut oil, virgin olive oil, sweet almond oil, jojoba oil, lavender oil and chamomile oil. The oil is a little thick and non- greasy. It gets quickly absorbed in the skin leaving a gentle fragrance behind. The skin instantly becomes soft and supple. It is non- sticky and spreads easily while massaging. My munchkin enjoyed her massage thoroughly and felt energetic immediately after that. My baby’s hair is very dry and I usually apply a little oil after washing them. I found Mama Earth’s shampoo very gentle. It does not irritate the eyes. The shampoo has aloe Vera extract, vegetable glycerine and lavender essential oil as one of the key ingredients. A little quantity is sufficient as it is thick and forms good lather with water. It gently cleanses the hair and nourishes them. After drying, I noticed there was no need to apply oil on her hair. Her hair looked soft and well nourished. There was a gentle fragrance and a healthy shine in her hair. Her hair was not dry at all after washing. Comb went through smoothly in her hair even without oil. My baby’s skin is very dry and sensitive. Her skin develops rashes immediately after bathing with even the most well-known branded soaps and body wash. Mama Earth Body Wash has vitamin E, Aloe Vera extract, vegetable glycerine and orange essential oil as its key ingredients. It is certified toxin free and hypoallergenic. A little quantity makes good lather. It is extremely gentle and nourishing. There was no skin or eye irritation while using it. After the bath, her skin looked very soft, supple and nourished. There was no dryness or itchiness which she usually feels after every bath. It has mild fragrance and leaves the skin very smooth and soft. My baby’s bath time ritual is never complete without a body lotion. The last product remaining in our kit was the Moisturizing Daily lotion. The baby lotion has Shea Butter, cocoa butter, olive oil, wheat germ oil, jojoba oil, calendula extract, vitamin e, and chamomile oil as its key ingredients. It spreads easily and gets quickly absorbed in the skin, leaving it soft and supple. It nourishes the skin very gently and is non-sticky. No more dryness and itchiness for my little angel now. The healthy glow on the skin is immediately noticeable. My angel loved her bath ritual so much that she took her Mama Earth baby Product kit with her while sleeping at night. The next morning, she wanted to take a bath as soon as she got up. My baby’s bath time has become more fun filled and loving with the gentle touch of Mama Earth. Mama Earth products are no less than a mother’s love. With the schools being closed for session end break, kids become desperate to go out somewhere. Mycity4kids is my first choice when it comes to searching for resources for children. Scrolling down the ‘Fun Places to go with kids’ section, my eye fell on this place called Toilet Museum. “Curious! Toilet museum? Is there even a place by the name in Delhi? Hmm!” my mind began wondering. I read further about it. The pictures looked not so interesting at first but my curious mind was not ready to give up so easily. To convince everybody to go there was not easy. Kids these days are more attracted to the electronics games and play areas in the malls which provide them instant pleasure and rewards. Finally, I managed to convince them and we visited the Toilet Museum on a Sunday afternoon. The place did not look very exciting at first situated in a very congested area of the city. However, it is very neat and well maintained from inside. A big hall holds various photographs, information, sanitation artefacts and different models of toilets from as early as 3000 BC. The place is run by Sulabh International, an NGO working for the cause of global sanitation. Outside the hall, there are various models of Sulabh toilets constructed by the organisation in various parts of our country as well as around the world. Sulabh toilets works on the decomposition of human excreta thus saving the environment from getting polluted. The organisation people told us about how apart from the sanitation facilities, they are working consistently on saving water and managing and turning human excreta into useful resources. For a smaller scale, Sulabh toilets are connected to two pits where the waste gets collected and is kept covered for two years. During these two years, the waste gets decomposed and gets converted into manure which is then used for agricultural purposes. On a larger scale, the Sulabh toilets are constructed in such a way where the waste then gets collected in a bigger underground pit. The pit is covered is covered with mud and plants are grown on it. The pit relates to pipes leading to three other sections. The solid form of the waste is converted to manure, the gases are collected in a huge gas container. The gas coming out from this waste is methane gas which is very harmful for the environment. Therefore, this gas cannot be released into the atmosphere. The gas is collected in the biogas container and from there it is used to light bulbs, generator and cooking purposes in the kitchen. The gas gets consumed leaving no pollution behind. The liquid is treated, purified and cleansed from all the impurities and used for irrigation purposes within the premises of the museum. The place proved out to be very interesting. The visit turned out to be educational and knowledgeable. Toilet museum surely is worth a visit. Yesterday I went to the market to buy groceries with my toddler and she insisted me on buying a surprise egg. It was the same as the one she already has. I tried to distract her and made many excuses. My attempts to avoid buying it only made her crying for it. Her howling in the market was so embarrassing that I had to buy her the surprise egg that she wanted. Every time we go to the market we end up buying things for our kids that they don’t need. Everything is in abundance in our houses these days. Children already have more than they require. Plenty of toys that they don’t even look at. Plenty of books that fail to attract them. Clothes more than they can wear. Unworn shoes that they have outgrown. With effect children, don’t value things that they have. They never even realise how much hard work has gone in earning the money that has been wasted in buying all those things lying unused. When we take them along to the market, we must tell them the price of the things that they ask for and give them a choice between two things. We should encourage them to make a wise choice and buy something which is more worthy and useful. Sometimes, distract them from what they are asking and make excuses (though it seldom works). Stories are a great way of explaining and teaching them life lessons. Children relate to stories. Sometimes telling them stories from real life examples is also a good way to make them understand life lessons. Kids usually love stories from their parent’s childhood, start something with “when we were children…” and you see they are all ears for it (mine often fall for this one). Take the opportunity of their father coming late from the office to explain to them the reason behind his working hard and over time. When they learn that their father works hard to earn money to buy things that they want, they will learn to value it. Give them pocket money but give them less then they need. Here is a story in relation to it. A young man and an old man planted a tree in their gardens. The young man gave the tree plenty of water and manure but the old man gave it only the required amount of water and manure. The young man’s tree grew to be very strong and robust one but the old man’s tree looked very average. One night there was a heavy rain and gust of wind. The next morning, the young man found his tree uprooted but the old man’s tree stood there as it was. The young man asked the old man how did it happen. The old man’s reply is a lesson for all of us. The same applies to our children too. Provide them less and let them learn to fend for themselves. Providing everything in abundance will only make them unable to learn to provide for themselves.